The Alternate Dock Facility features a 5 span, 178 m long, continuous steel plate girder upper level viaduct and 20 m long, upper level and lower level adjustable, steel transfer ramps. Portal frame piers founded on spread footings were utilized with details that allowed the main longitudinal girders to be continuous through the transverse pier girders. The longitudinal main girders were placed at tangents to the curve (the curvature was made up by varying the cantilever overhang of the concrete deck along the length of the girders), so the detail had to accommodate both longitudinal and transverse bending forces at the pier locations. Wheel loads in excess of that described by the CL-625 truck (prescribed by CAN/CSA S6-06) were investigated and included in the analysis. The heavier wheel loads were the result of the Marine Atlantic Yard Tractors (Ottawa Trucks with a single rear axle) moving trailers onto the vessels. The adjustable transfer ramps (with a true hinge at the on-shore end) are raised and lowered by large hydraulic rams connected to a steel, lifting beam with a box cross-section. A combination of steel grating and steel plate was used as the deck to minimize the load to be lifted by the hydraulic rams. The design of the transfer ramps was complicated by the varying dimension between the upper and lower levels of different vessels using the facilities as well as the minimum clearance required between the upper and lower levels. The solution was to provide steel girders with a shallow profile and variable depth along their length. Wheel loads in excess of that described by the CL-625 truck (prescribed by CAN/CSA S6-06) were investigated and included in the analysis. The hydraulic ram lift towers were founded on a combination of an existing concrete caisson wharf structure and a new concrete caisson, constructed on land, launched with a slip table, floated into position and sunk into place. A full assessment of the existing concrete caisson wharf structure was conducted to verify its ability to accept the new loads imposed by the new lift tower. Project staging / phasing was an important aspect of the design due to the tight site, existing infrastructure and the need to keep the adjacent Gulf Span Dock operational throughout construction. Significant rehabilitation of the existing wharf finger and caissons was required while the finger was still operational as a mooring line support for the Gulf Span Dock. The principals of HEC, Robbie Fraser, MSc., P.Eng. 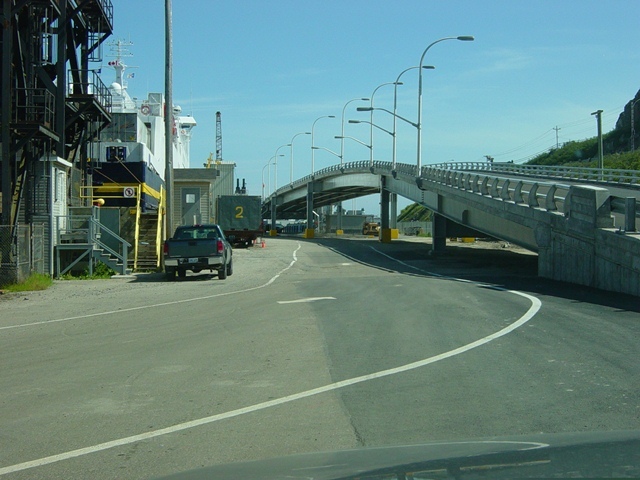 and Greg MacDonald, P.Eng., completed the detailed design of the Alternate Dock while still employed at CBCL Limited. 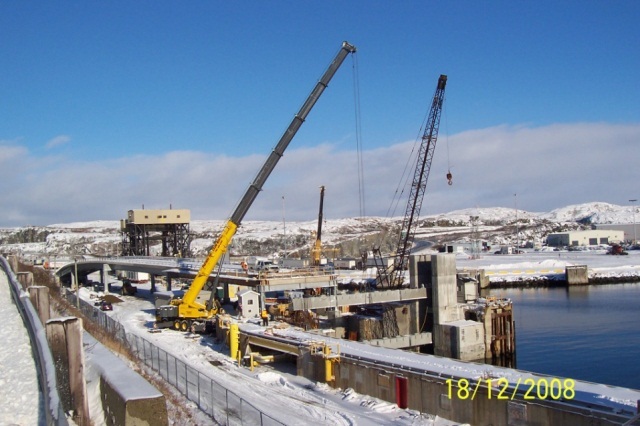 Construction for the project was underway when Mr. Fraser and Mr. MacDonald formed HEC in October 2008 and, as such, HEC continued to perform construction services for the project until its completion in 2009. The project was completed on-time and on-budget with no disruption to the operation of the ferry facility, including the adjacent Gulf Span Dock.